SharePlus supports all kinds of SharePoint Lists and Libraries. On the application, the List Icon indicates the List type. To access a list, navigate to the parent site and tap over the list. Once in a list or library, you can scroll up and down to navigate through all the list’s items. 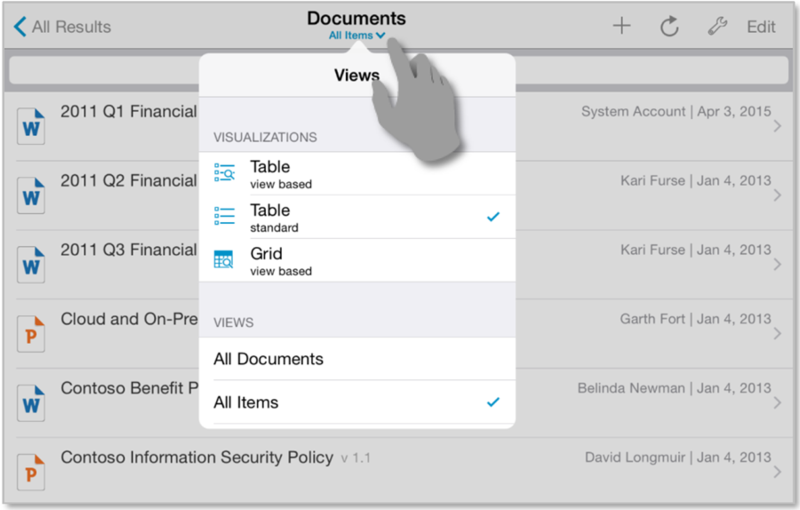 Tap Views to access SharePlus List Visualizations and SharePoint List Views. Scroll up and down to navigate through all available settings. SharePoint List Views are pre-defined configurations created on the server to organize and filter the items of a list, depending on the needs of different SharePoint groups of users. 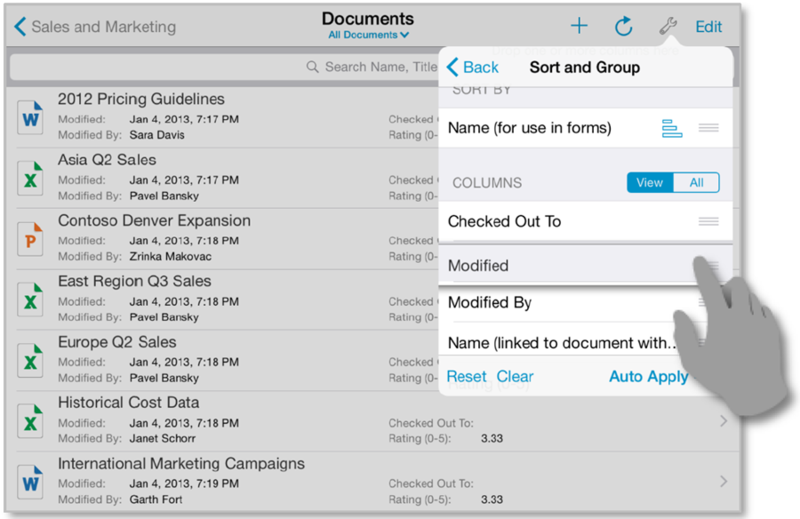 To choose a List View, tap Views and select among the Views you have access to. The layout of the Lists can be adjusted using List Visualizations, e.g. 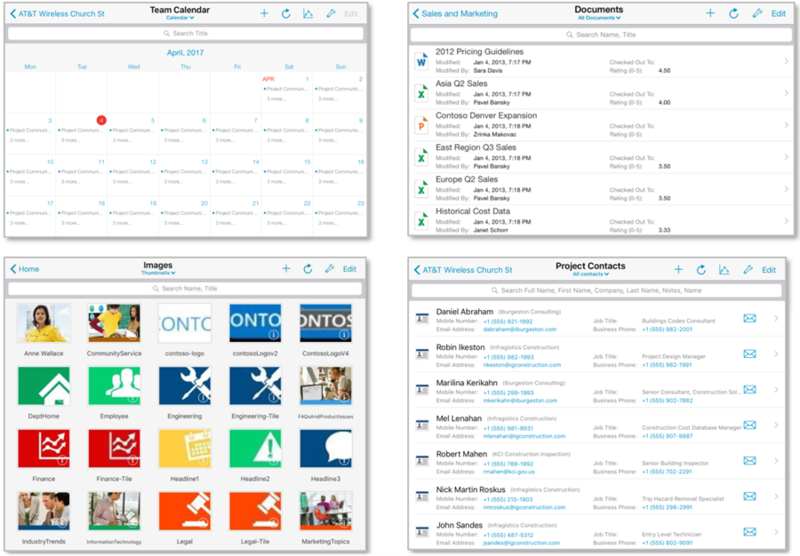 table, grid, calendar view. The default and available Visualizations depend on the list type and settings, e.g., the Calendar compact Visualization is only available for Calendar lists. Table view-based: display the items in a vertical list with their icon and basic information based on the list view. Table standard: items are displayed in a vertical list only showing their title. Grid view: displays the items in a spreadsheet fashion, one line per item and one column per metadata field. Calendar view: this is a calendar-specific view (only supported for calendar lists) which supports daily, weekly and monthly views. Picture Board: this is a picture-specific view (only supported for picture libraries and asset libraries) that displays picture thumbnails over a dark background to provide a better image visualization. Once you enter the sort and group settings, you will find there are different buttons and actions available. You can specify group by criteria by dragging List columns to the Group By section or sort criteria by dragging columns to the Sort By section. You can easily switch the SharePoint List Views and SharePlus Visualizations by tapping the view name to open the Views selector under the list/library name. SharePlus provides both basic and advanced list filters based on complex criteria and defined by the user through the current list’s available columns. Results will be displayed as items in the current list view and will be cleared once the search tool is dismissed. This filtering method allows the user to locate items based on their name or title. The filtering bar used for this method is displayed on top of any list browsed in SharePlus, and it can be used quickly to find an item within a list filtering by its name or title. 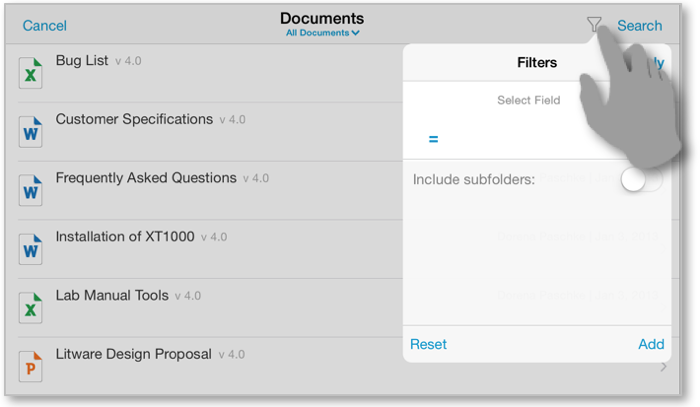 The Advanced Search tool allows users to define complex and powerful filtering criteria within a list. This type of filtering complements the "standard" filtering for cases in which the user needs more control or detailed criteria. To open the Advanced List Search, tap the funnel icon on the UI; a popover panel id displayed below the filtering bar as shown in the image below. 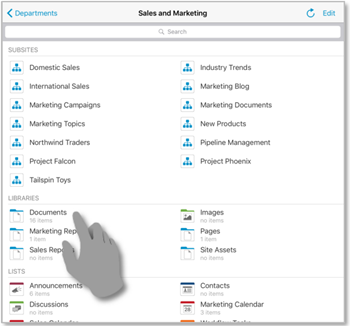 The funnel button in the top right corner displays the popover panel. Fields and Conditions add relevant information to be used by the filtering criteria, e.g., “Equals”, “Is null”. 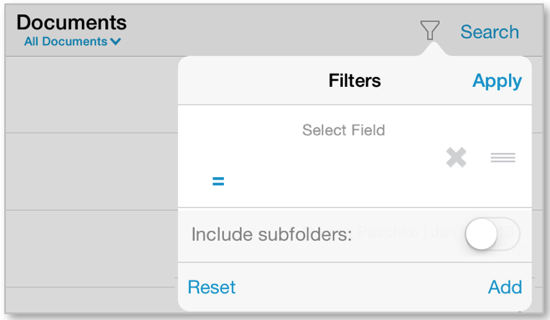 Extra fields can be included with And/OR operators to expand the filtering criteria.